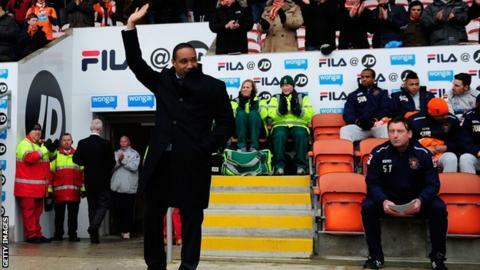 Chris Wood missed a second-half penalty for Leicester as Paul Ince's first home game in charge of Blackpool ended in a goalless draw at Bloomfield Road. Wood, who has netted 19 times this season, hit the bar after Foxes debutant Harry Kane was fouled by Neil Eardley. Blackpool went close through Thomas Ince and Eardley before Wood spurned another chance for the visitors. The New Zealand striker missed from six yards after good work by Lloyd Dyer. Ince has yet to see his new side score since taking charge last week. But the former Blackburn Rovers manager will be optimistic about his new team's chances after his side secured a hard-earned point against a team chasing promotion. Leicester started strongly with Kane, on loan with the Foxes from Tottenham, unleashing a venomous volley that keeper Matt Gilks did well to palm away. Blackpool responded through a long-range attempt from Ince, the 21-year-old son of the new Blackpool manager, while Leicester keeper Kasper Schmeichel was also alert to deny Eardley. Wood stepped up to take the penalty and opted for power, thumping the ball against the woodwork and away to safety. Dyer then gave Wood an excellent chance to redeem himself. But the former West Brom forward once more went for power rather than placement as he smashed the ball wide from close range. "We do need a few players in just to freshen things up. The players have been fantastic since I got here but it's been a difficult couple of months for them. "I thought we thoroughly deserved a point - it was our first clean sheet for ages. It is a start. "I think results can be deceiving. Even though we didn't get the win, we enjoyed the game." "I was very pleased with how we went about it. I thought we were very solid at the back. "At the moment we're just not able to convert enough of our chances. "But I think as long as we apply ourselves in the right way we'll come through that because I've got a lot of faith in my players."